I have been under a shower of SHF citrus entries this past week and although I need to (happily) bathe in over 100 entries in the coming days, nothing would make me happier. Thank you in advance to all of you who participated and remember I will accept a few stragglers if you come to the party with an extra box of lemon sour candies! Before I proceed with these lovely Rum Babas, I need to announce the winner of the Cherry Blossom Extract: Congratulations to Suzana of Home Gourmets ! Please email me with your mailing address so both Rachael and I can get the 2 bottles on your way. When I was little, I loved going with my mom to the bakery in town after church on Sundays, helping her select the little mini pastries that would end up on a dessert tray after lunch at my grandparent's. There always was a selection of different flavored eclairs and cream puffs, a couple of mini fruit tarts and Napoleons and a couple of mini rum babas. I used to repeat that name on the way there and on the way back to the house: "baba au rum...baba au rum...baba au rum..." I just found its resonance funny and comforting, thoughts of roundness and "plentiness" and exotic places. Except for one thing: even though I was already allowed to drink a little wine drowned with a lot of water on Sundays, I was not allowed more than one bite of the rum babas because they were drenched in alcohol...and drenched they were (no wonder our baker was a happy man!). As soon as I started working in bakeries and put in charge of babas production, I figured I was old enough to eat them too. I had my share of this traditional pastry: a yeast based cake, with a very spongy and delicate texture all bathed in a orange and rum flavored syrup. Nothing else...no gilding the lilies with whipped cream or fruit. Although it is a little more on the bready side than a cake, there is nothing heavy about it....pure rum air....try not to inhale half a dozen minis at once! It had been a long while since I had made some but the arrival of a lovely birthday present prompted me to change that situation. Last year, my buddy Inne and I started to discuss the pastry work of Hidemi Sugino, Japanese pastry virtuoso. I have loved and admired his creations for years and when she mentioned she had a friend who could get the book in Japan and bring it back to her so she could then send it to me, I know I let out a loud "Yes!". Lucky me, it came in the mail for my birthday along with some plates I used here and here. Thank you Inne! I don't read Japanese but thankfully in this book, the recipes are translated in English. Allright, so translated may not be the right word as the English used is really wrong in some sentences but you get the gist of it fairly quickly. I was relieved to see that the original measures in grams had been kept although there are equivalences given in spoons and cups. I can't tell you if this part is accurate because I had no time to double check and I must add that I used the grams, my personal preference in baking. His Citrus Babas caught my eye the first couple of minutes I started looking at the mouth watering desserts put together for the book. The dough was mixed with a citrus puree, the baked babas soaked with an orange syrup and topped with an orange liqueur flavored pastry cream. The citrus puree called for whole citrus to be poached and puree, skin, pulp and rind. Where it might work beautifully for the kumquat recipe used, I thought not so much if I did a mix of grapefruit, lemons, lime and oranges since kumquats are out of season here now. I kept the rinds of the lemon and limes and used all the citrus fruit pulp. I changed the syrup to incorporate some rum and since I had half a batch of Lime and Mascarpone Mousse left, I topped the finished babas with a dollop of these. Use the flesh and some of the rinds of the fruits, add the sugar and water and put all in a saucepan over medium heat. Bring to a boil and cook for 2 minutes. Let cool. Remove the cardamom pods. Puree until completely smooth. Bring all the ingredients to a simmer and cook until the sugar is dissolved. Let cool to room temperature. Transfer the syrup to a wide, shallow pan. Dissolve the yeast in the lukewarm water and sugar and let stand until foamy. In a separate bowl, whisk the eggs and the milk together. In a stand mixer fitted with the paddle attachment, mix the yeast mixture, flour, salt, add the egg mixture and butter. Mix until all the ingredients are combined and you get a soft dough. Let rise in a warm place until the dough has doubled in volume. Punch the dough down and add the citrus compote. Mix until well combined. Drop the dough by tablespoons full in babas molds or muffin tins or whatever you have available. Let rise until nearly doubled. Bake at 400F for about 15 minutes. Let cool on wire racks. Unmold the babas. Soak the babas into the syrup, upside down first and then flip them over. Let them soak a minute and transfer to a wire rack to drain the syrup. Reserve the syrup. You can keep the babas in the fridge until plating time, well covered. To plate: top each babas with a dollop of mousse, drizzle with the reserved syrup and add some mint and lemon rind or zest if desired. I thought that adding one more citrus post to this month of May could not hurt and wish to dedicate these Citrus Babas to my mother for Mother's Day. I know I am a day late but I thought that she would forgive me if I made one of our favorites, a baba...all pretty and citrusy. Plus, she was spending the day with my dad, brother and her granddaughters. Mom, I love you! Everyday, you show me the importance of giving of oneself, giving love and friendship, lending an ear and a welcoming hand and I can only hope to be half as good as you are. You radiate love and laughter to all around you and I strive to make you proud although I make you worry sometimes and sometimes I make you laugh. I know I make you scratch your head and I know I make you raise your hands or roll your eyes...but I know that you and you only understands me when I sing you Sinatra or Singing In The Rain. Mom, you are my lucky star....I love you! Helen, what a sweet post to go along with a lovely dessert! I grew up also having just a bite of a babas rum which my mom made from time to time. Thanks for another beautiful dessert and sharing the story with picture of you and your mom. so sweet :) reading your post makes me missing my mother a lot more. anyway, the baba looks really lovely. Looking fabulous and I love the use of the mousse since I love that recipe of yours! Those Babas look gorgeous and delicious! A wonderful combination of ingredients! What a mess tears and drool make! You really know how to whip the heart strings with the little girl repeating baba au rum who charges ahead to baking out of this world looking babas to hugging her mom with lovely words! I say a very big hug and thank you to your mom! These babas are really lovely so glad Inne sent you this book! It took blogging and my scale but now I always click my heels and smile when a recipe is in grams and change the recipes that aren't ! What were we thinking!! What a beautiful entry :) I've never heard nor tried babas before, but these look really good! I love your presentation of it. What a sweet, simple and moving Mom & Daughter love post! It's been years since I had a baba au rum... these look awesome, as usual. How wonderful to feel like that about your mother. You are so lucky. A lovely post. I love babas and this looks an amazing version. Thank you for sharing. What a beautiful post Helen. Beautiful words about your mom, beautiful childhood memories (you know how I love remembering those!) and gorgeous baba. Baba au rum happens to be one of my favorite classic desserts and I love the little square shapes. Cute! I am also enamoured with all these Japanese pastry chefs... excellent technique and new flavors. Loved this one! I can't wait to see the SHF round-up! This is such a lovely dessert Helen, I've never had babas au rum but they sound divine! Beautiful tribute to your mother, beautiful babas I always shied away from these precisely because they were soaked in rum syrup, but you make me want to try again. And I *love* the square-shaped molds you used! Helen, in a word DIVINE! These little babas are adorable! I made full sized ones for a while one spring trying to get something fantastic but never hit the mark (they were always more trouble than they were worth to be honest). So, I'm going to bookmark this recipe and give babas a try again soon. Congratulations to Suzana for winning the cherry-blossom extract! Oh I havent had a rum baba in ages! These sook so wonderful. What a beautiful daughter you are. This dessert is elegant, delicate...just like moms are! mmm these look delicious! i was looking for something to bring as a dessert to a wedding shower, these seem perfect... bite sized and packing a punch! the pictures are beautiful. You are a baking genius! Every post just betters the precious one. I have never even tasted these beauties before, but you have left me inspired.Thank You. These citrus babas look divine. I know if your Mother was in town, she would love to share them with you. I'm so glad she had a wonderful Mother's Day with your family. I oogle Hidemi Sugino's work too. I've found some pictures of his pastries on Google and I admire his artistry. I'm so glad you got his wonderful book for your birthday. I can't wait to see all the beautiful desserts you make from it. Thanks for hosting Sugar High Friday this month Helen. I can't wait to see the roundup. I have never tried nor made babas, Helen, an these look so good! looks yummy!!! A great tribute to mom.I'm sorry I cannot make your shf, I got swamped with so many things and my nephew and a friend is in town for the weekend. You made me miss my mother even greater than I usually do and that's pretty hard to surpass. Your babas look so delicate. Lovely post, and mouthwatering photo! What a beautiful dedication! A lovely looking dessert too! that is lovely. how sweet :) great presentation too. I've never tried rum babas but I have to agree with you, they do have a cool name. These look like they'd be a fun summer dessert, too :). Pretty presentation. You're right - the name is wonderful to say. But the dessert itself looks even more wonderful. I love the way you've garnished it. And what a terrific way to send love to your mother. but I envy you as the same time. 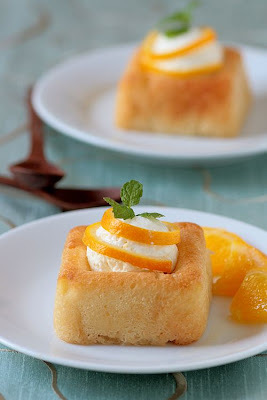 btw, the citrus and cardamom rum babas looks tasty..
your words to your mom really touch my heart. isn't wonderful to have such a great mom like yours in your life? 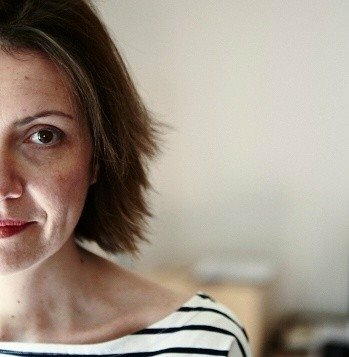 bravo, Helen! Congrats to Suzana for winning! What a great baba recipe! Looks very delicious! Nice dedication to your mom. How sweet! Beautiful presentation - I bet they taste gorgeous too! Quick question: you say to use cardamom pods in the compote - do you mean green or black? Most recipes don't specify but I actually happen to have a stock of both and I'm not sure of their differences. Thanks! What a great loving picture of you and your Mom. I am quite sure she is SO VERY proud of you. And you exude that warmth in your posts all the time! I love this little cake. I have never had anything like this before. Oh the things I am learning from you! Salute to you and your Mom! I love how the babas tenderly cradle the mousse! beautiful post and photo! i have never made babas before, so i am going to have to put on my must try list! 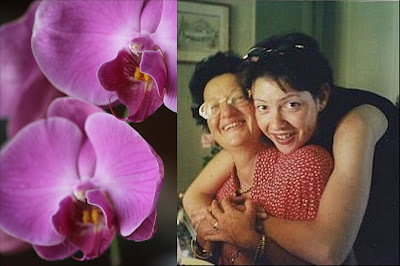 A great post and dedication to your Mum Helen. Stunning! The presentation alone is incredible, I can only imagine how it tastes. I absolutely love the name, it just stands out. Not to mention your beautiful photo! You rock. Oh Helen! What a lovely tribute to a wonderful woman. You two have the same gleeful look and sparkle in your eyes. Beautiful as always! Lovely post to your mom! this is so wonderful, such a nice twist to the conservative baba au rhum! I've been noticing all the citrus recipes you've been posting lately and you really have been coming up with an amazing array of recipes using just one citrus base! 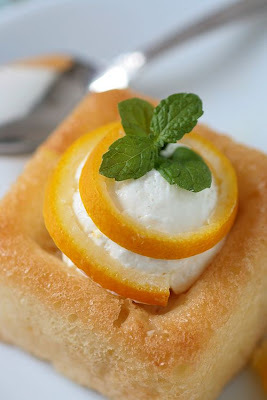 As a former pastry chef, I adore citrus desserts and ironically found them the hardest to sell, especially grapefruit. They are in fact the most delicious, and so is this post and the beautiful photo of you and your Mom. Mostly spend my time painting now (I'm an artist) but hope to have time soon to try your fabulous recipes. Love your blog - your passion for what you do and your personal touch are wonderful and inspiring. You already know how much I love the relationship you have with your mom. That picture is just precious and it shows what a dear you are and where that must have come from (your mom!). wonderful. one of my favorite things to do growing up was going to this little french bakery with my mom and picking up some babas au rum! i didn't realize there was so much alcohol in them when i was younger, and now i am surprised that my mom encouraged me to eat them! :P i have not had one in ages really...and have been in search of a recipe for quite some time now...i think i've found the recipe i am going to make! :) thanks!